Welcome to the guide. Please use the menu on the right to navigate. 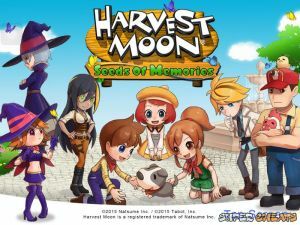 Harvest Moon: seeds of memories, one of the pioneers of the farming simulation genre, is back and is now available on multiple platforms. The game is developed by Natsume Company Ltd. and has provides owners of the Wii U, PC, iOS, and Android a chance to try the game out. As with most versions of the Harvest Moon series, the player discovers being in a small town and is tasked to revive a farm entrusted to the player. This time, the town is called Chestnut Town, a small and simple town wherein players may freely, and easily (given the size), interact with other townsfolk. One of the basic gameplay revolves around maintaining the farm by planting and selling crops for money you could use to buy better Tools, a better house, upgrade facilities, and even buy gifts for friends or eligible bachelors and bachelorettes the player may choose to marry later on in the game. Harvest Moon: seeds of memories was reveled during the 2015 E3. No discussions open for Harvest Moon: Seeds of Memories at the moment.